A history of tax hikes to prop up unsustainable spending makes Illinois a frosty climate for small businesses. Nov. 24 marks Small Business Saturday in the United States. And Illinoisans have a lot to celebrate. Businesses with fewer than 50 employees created the vast majority of net new jobs in Illinois in 2017, according to data from the U.S. Census Bureau, accounting for 83 percent of jobs growth. In fact, small businesses have been the primary drivers of Illinois’ recovery from the Great Recession. From 2011 to 2017, small businesses generated nearly 130,000 new jobs in Illinois, or 62 percent of all jobs created over that time period. While the question of whether Chicago would land Amazon’s second headquarters drew plenty of attention this year, focus on that big-ticket item actually overlooked the lifeblood of Illinois’ economy. 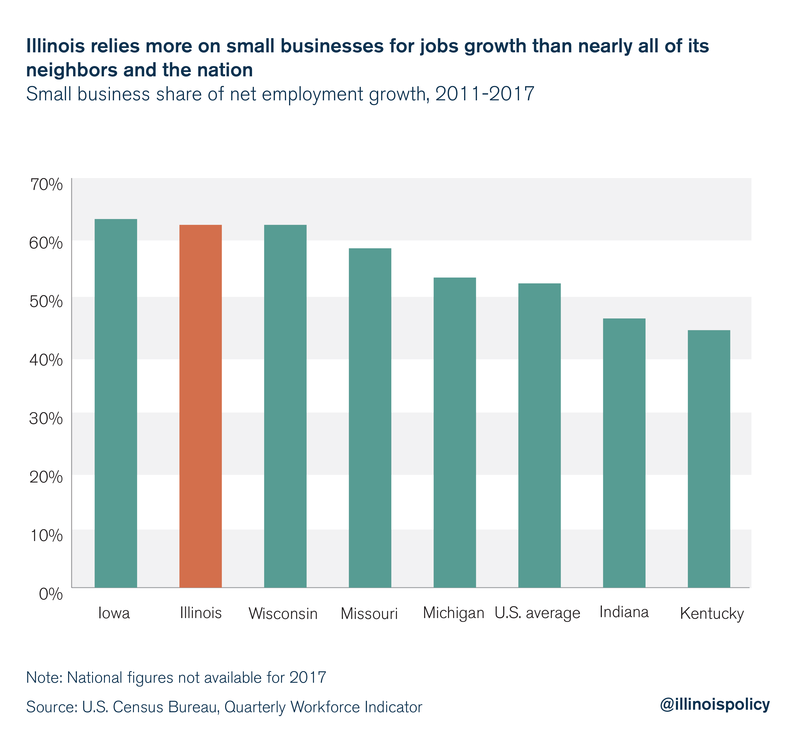 Not only are small businesses the primary driver of job creation in the state, but Illinois also relies more on these “mom and pop” shops than most of its neighboring states and the nation as a whole. 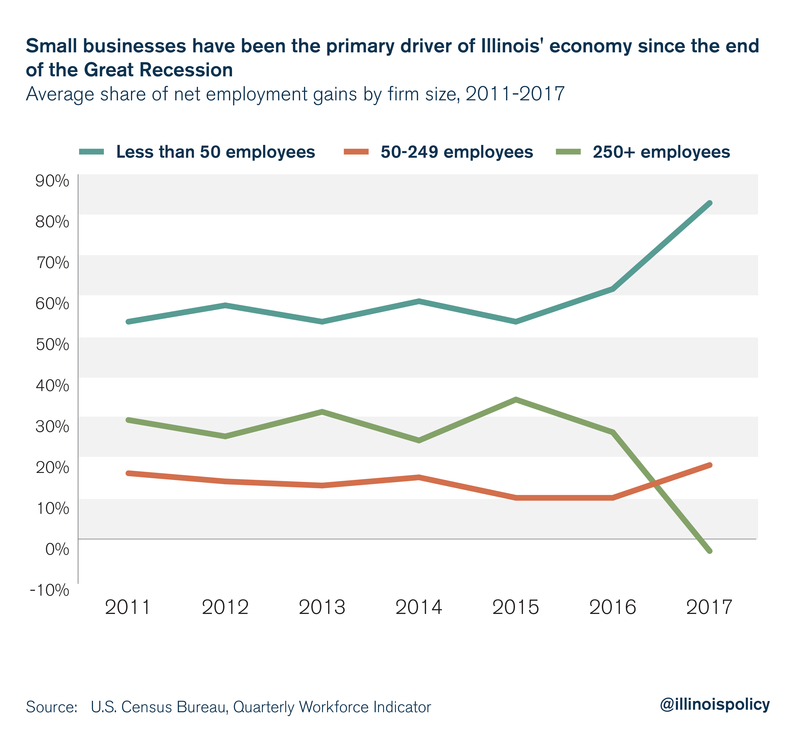 That said, it’s important to note that just because Illinois is so reliant on small business for jobs growth doesn’t mean the small business climate is healthy, or that the job market is improving. Even though small businesses play such a vital role in the state’s economy, they often face cruel treatment from state lawmakers in the Land of Lincoln. During election season, many hopeful candidates paid lip service to or even ran on the platform of fostering a friendly business environment within the state. However, the historical records of Illinois’ lawmakers don’t reflect this sentiment. Illinois businesses – and business owners – already pay property taxes that are among the highest in the nation. On top of their heavy property tax burdens, lawmakers slapped corporations and individuals with the largest permanent income tax hike in state history in 2017. This heavy burden helps to explain why small business owners and entrepreneurs ranked Illinois last in the nation for small business friendliness in August. Meanwhile, larger businesses with more than 250 employees – which actually shed jobs on net in 2017 – regularly receive tax incentives to do business in Illinois. One of these businesses, Takeda Pharmaceuticals, announced in September its plans to close its Deerfield, Illinois, headquarters. Illinois’ Department of Commerce and Economic Opportunity issued more than $60 million in Economic Development for a Growing Economy, or EDGE, tax credits to Takeda from 2003 to 2013. So what do small business owners get in return for their increased tax burdens? Not much. Despite a record income tax hike in 2017, state lawmakers did nothing to address the main cost drivers behind Illinois’ fiscal woes. They failed to pass meaningful reforms to address the state’s soaring pension costs, its collective bargaining laws that stack the deck against taxpayers, or the roughly 7,000 layers of overlapping, duplicative and costly units of local government. Taxpayers increasingly face service cuts despite higher tax bills as Illinois governments try to keep up with escalating pension costs. In January 2019, members of the 101st General Assembly – which will be dominated by the largest Democratic majority in state history – will take their seats in the Statehouse, and Democratic Gov.-elect J.B. Pritzker will be inaugurated. They will face an estimated $2.8 billion budget shortfall, and the uncertainty over the upcoming budget will bode ill for Illinois businesses. Business owners make investment decisions with expectations of future returns. Given the risks involved with any business decision, economists agree it is important that public policy does not add to the risk business owners face. Illinois already has an unfriendly business environment, and any uncertainty over the future tax burden will likely lead to business owners holding off on investment and hiring decisions, ultimately resulting in slower economic growth. Hopefully the governor and the General Assembly will look to pension and spending reform to balance the fiscal year 2020 budget and budgets going forward, instead of using a progressive income tax to reach back into the pockets of small business owners. A progressive income tax would be devastating to small businesses, as many small business owners would be slapped with a tax hike. A progressive income tax hike would ultimately harm small business employment as well, as progressive income taxes deter the capital accumulation and investment that ultimately drive jobs growth. Hiking taxes to prop up unsustainable spending will harm the private sector businesses that fuel the jobs growth Illinoisans need. 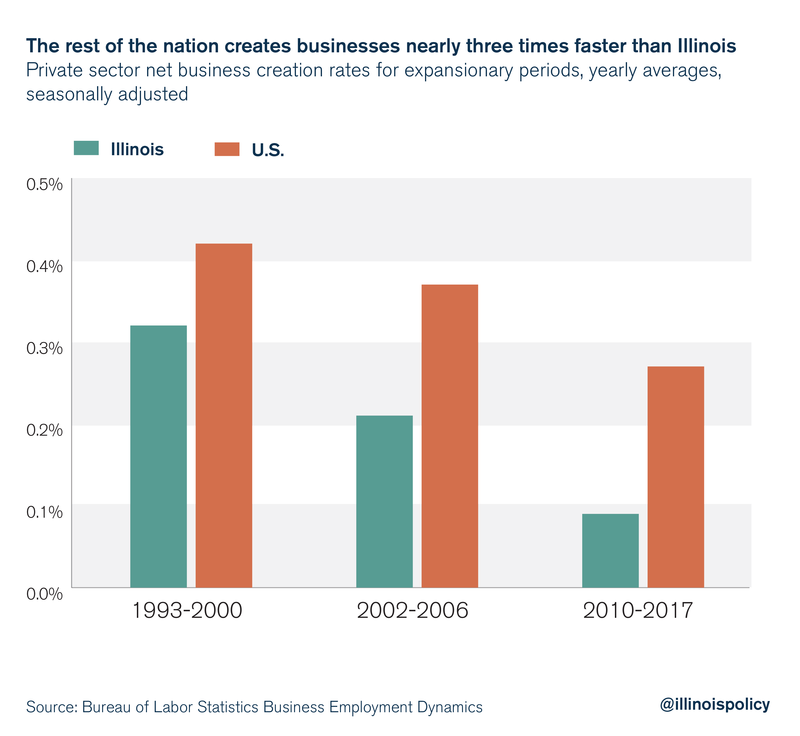 Illinois’ business creation rate is already around a third of the rest of the nation, and tax hikes would further widen that gap. While Illinois used to be a more competitive place for business, this is no longer the case. As other states have improved their tax climates – eliminating estate taxes and lowering income and property taxes – Illinois has continued to resort to tax hikes. The result of these failed policies has been a plummeting business creation rate, a labor market that continues to underperform compared with the state’s peers, and a real estate market that is one of only three in the nation where housing has become a worse investment. Illinois’ small business owners deserve better. In the 101st General Assembly, lawmakers have an opportunity to support a spending cap that would curb Illinois’ overspending by tying spending growth to long-run economic growth. The spending cap constitutional amendment would create true certainty for small business owners, unlike the current balanced budget requirement. Allowing the state budget to grow in line with the state’s economy will allow for the delivery of core services while encouraging efficient use of taxpayer money. Instead of spending that outpaces taxpayers’ ability to pay, spending would rise proportionally with the state economy, reducing the need for frequent tax hikes. This could bring stability to Illinois and make the state more inviting for businesses of all sizes. If state lawmakers refuse to reform their spending habits, employers large and small will follow Amazon’s lead in choosing other states over Illinois.